Falcon View is a pre- planned residential depiction to get landed in Panchkula, Chandigarh. This renowned real estate group has organized this project with number of grand residential options such as 3,4 BHK. These well designed accommodations are getting assembled in the area taking up from 2480 Sq.ft - 3012 Sq.ft. This lush hub of distinct residential configurations is numerous transport services for public use. This enormous residential undertaking is offering a price segment starting from 1.05 Cr. - 1.27 Cr. In the modern era, we all want to look for the best designed homes that are equipped with tremendous features and great modern luxuries. In this hunt of finding glorious and magnificent luxury living places, we do so many researches and check the quality of several best range of projects. If you are still in this type of search in Chandigarh and are still way from your dream home, then please have to look at the astonishing JLPL Falcon View. The beautifully constructed ultra-luxurious project comes in proximity to so many public and social utilities and facilities. The infrastructure around this project is very advanced and developed and you can experience here smooth and rapid travelling from this development to all the major landmarks and destinations in Chandigarh city. There are stylish apartments in JLPL Falcon View Panchkula available in 3 and 4 BHK variants with sizes to range from 2480 sq. ft. to 3012 sq. ft. Once you get into this complex, your all worries and tensions about searching a perfect living home will be removed as all the modern features, specifications and modern comforts are available in this township. The apartments are well-spacious and well-ventilated in Falcon View Panchkula and therefore, residents here can keep themselves fit and stay healthy by enjoying here the ample natural daylight and fresh air in these comfortable modern homes. There are elegant floorings, premium fittings, furnishings and finishing in these homes. All the bedrooms have split AC units and have laminated wooden floorings, kitchens are equipped will all the latest provisions and equipment. 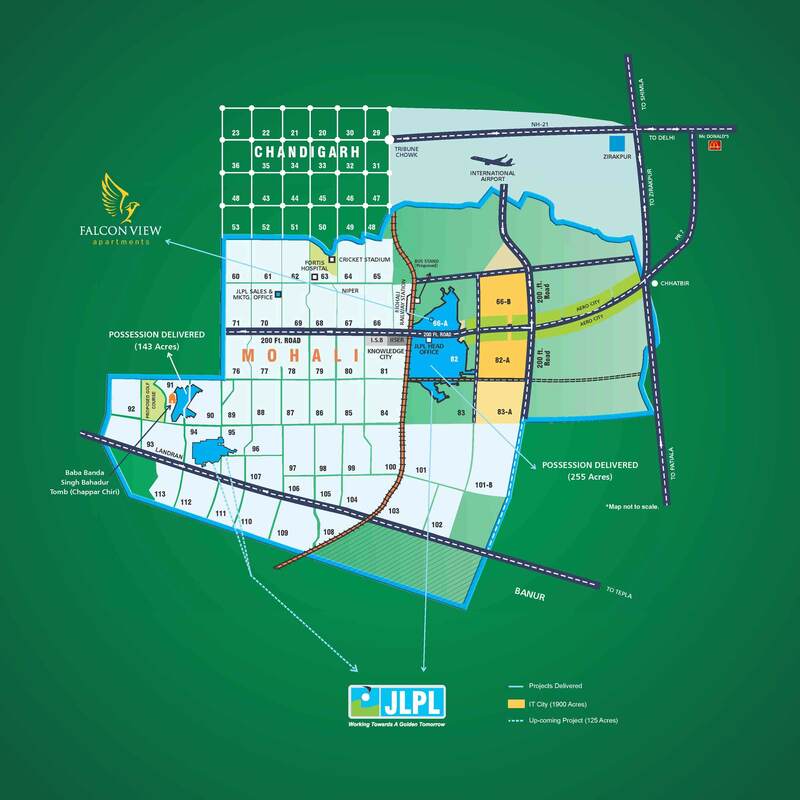 A large number of top hospitals lie in close proximity to JLPL Falcon View and there are many renowned schools, restaurants, shopping malls around it. Amenities are the special effects here and you can find here the best and supreme luxury features like basketball and tennis courts, jogging track, 24X7 security, indoor games, swimming pool, clubhouse, gym, intercom, car parking, power backup and much more. So, make a bold decision and live with the wonderful community of people in this society. Book here an apartment in comparative JLPL Falcon View Price ranging from INR 1.05 crores to INR 1.27 crores. Doors & Windows : 7'6" high polished solid wood door. Fixtures & Fittings : Modules switches of North West / Legrand / equivalent make with copper wiring. Walls : Plastic emulsion paint on PoP punning. Ceiling : Plastic emulsion paint on PoP punning. 5 Minutes drive to International Airport. Within easy reach PCA Cricket Stadium and Fortis Hospital.